If you’re reading this, it likely means you’re considering buying a protein skimmer for your aquarium. Perhaps you’re setting up a reef tank, know that you need one and are doing your due diligence and research? Or maybe as an aquarium enthusiast, you’ve just heard of these devices and you’re wondering what benefits they could bring to your tank? Maybe you’re looking to see if you or your tank is missing out on something? Whatever your reasons for being here, if part of that is a search for the best protein skimmer, we’ve got you covered. In this article you’re going to discover what protein skimmers are, and how they work. You’ll learn what types of aquarium can reap the most benefits from one, how to install and maintain them, and what to look for in skimmers to suit your tank. You’ll also become familiar with the different types of protein skimmers that exist, and how to choose one to match your exact needs. Finally, we end the article with recommendations for the best protein skimmers available on the market today. What Type of Tank Needs One? 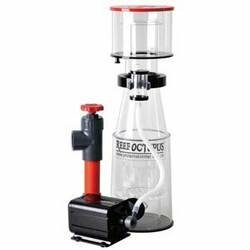 Do all Reef Aquariums Need a Protein Skimmer? The name makes it sound like something you might find at a butcher’s shop. Actually, a protein skimmer for an aquarium acts like a filtration device. But you already have a filter in your aquarium. So you’re probably wondering what the point of a protein skimmer is? Your filter cannot remove everything from your tank. Some compounds are hydrophobic – such as oils – meaning they repel water. These can collect at the surface of your tank, and your filter won’t be capable of clearing them out. A protein skimmer performs the task of foam fractionation in your tank. In simple terms, foam is used to separate water-repellent substances from the aquarium water. Precisely what this process entails can vary, depending on the model of protein skimmer being used. Different models utilize a number of different methods of foam fractionation, including turbo, Venturi, counter-current, etc. These various methods will be explained further on in this article. In general, they all boil down to the same concept. The foam produced collects any useless gunk in your aquarium. This foam consists of thousands and thousands of microscopic bubbles. Each individual bubble draws and holds organic waste to its surface. These bubbles (in the form of foam) are then circulated back to the protein skimmer collection cup. If your tank is particularly dirty when you initially use a protein skimmer, the foam will appear scummy. Over time, the collection cup will fill up with all the nasty organic compounds you don’t want in your aquarium. All you have to do is dump out and clean the cup, and then continue to use your protein skimmer. Note that protein skimmers are built not to deplete the water in the tank. Once the foam is sucked into the collection cup, the freshly cleaned water is returned to your aquarium. They’re made for cleaning saltwater tanks. If you have a reef or marine aquarium, a protein skimmer could be a valuable piece of equipment for you. This is because salt water is denser than fresh water. The saltier the water is, the more mass it will have. In turn, this allows it to foam in a way that fresh water can’t. You can see this in action if you look at the ocean. We’ve probably all witnessed foamy waves hitting the shore at some point or another. This can happen if the water is agitated, such as during a violent storm. Foam in the ocean can also occur under normal, calmer conditions. The ocean is an ecosystem, just like your saltwater aquarium, albeit on a much larger scale. The water contains all sorts of organic refuse, from proteins and fats to rotting plant life. Since your saltwater aquarium doesn’t have the same natural water motion as the ocean, a protein skimmer does the job for you. This agitation allows potentially harmful substances to be removed from your tank before they have a chance to build up. Most established marine and reef aquariums could benefit from a protein skimmer. There are multiple advantages to having one, which we’ll delve into later. However, if you’re just starting out or have a small tank, you may not need one immediately. Some species of fish and coral can survive without the help of a protein skimmer. The same goes for those of you with relatively low-population aquariums. The less life you have in your tank, the less waste is going to accumulate. In time, you may add more residents to your aquarium – fish and/or plants. At that point you may have to think about buying a protein skimmer. Certain filter-feeding organisms can actually do the same job as a protein skimmer. These helpful organisms consume debris such as fish feces and uneaten food, so if you populate your tank with these creatures you may not need one. That said, you should take care to monitor the quality of your aquarium water. Are you noticing that your saltwater aquarium is prone to oil slicks or a dirty-looking surface? If so, a protein skimmer is in order. There are lots of perks to introducing a protein skimmer into your tank. This piece of equipment can be an asset to you as well as the inhabitants of your aquarium. Surface scum is one of the least attractive things to find in your aquarium. Aside from being unpleasant to look at, your fish are unlikely to thrive in dirty water. Scum in your aquarium is made up of all sorts of things. Some types of fish food can be fattier than you expect. If this type of food floats to the surface and bobs there, it will start to exude an oily residue. Microalgae blooms can also cause your tank’s water surface to appear scummy. This is due to the proteins they produce as they grow. If you ever reach into your aquarium with dirty hands, you can end up with scummy water too. This is just one reason why you should always wash your hands thoroughly before handling anything inside your tank. Regardless of what the scum is made up of, protein skimmers operate as efficient cleaners. Anything that is not absorbed into the water will be removed through the foam fractionation process. Like any ecosystem, your saltwater aquarium must maintain a delicate balance. If any element is lacking or found in excess, it can throw the whole environment off balance. This doesn’t just apply to things like water chemistry—the pH, oxygen levels, etc. Too many nutrients floating around in your tank can be just as bad as too few. If your fish and other aquatic life don’t consume nutrients, algae will. Almost every aquarium tank will develop an algae population at some point. While some is okay, these opportunistic plants should not be given free rein to grow out of control. Remember that algae are hardy and need very little to grow. If your aquarium is oversaturated with nutrients, eutrophication can manifest. This is a term that refers to explosive algae growth due to an overload of nutrients. Needless to say, you don’t want this happening in your tank. It can be tricky to ensure that all extra nutrients circulating in your tank are filtered out. Here’s where a protein skimmer is a big help. It will collect any unneeded nutrients, preventing algae from flourishing. These same unnecessary nutrients can also make your tank hospitable to bacteria growth. These sorts of bacteria can be quite harmful for the residents of your aquarium. Plants aside, all the animals in your aquarium thrive on oxygen. Low levels of oxygen are associated with a poorer quality of life for fish, zooplankton and other aquatic creatures. This is why many saltwater aquarium owners invest in water-motion devices, such as wave makers. Any sort of water motion distributes oxygen evenly throughout your aquarium just as it does in natural bodies of water. As we’ve explained, a protein skimmer will contribute to moving the water in your tank around. Protein skimmers also remove waste, including bacteria, from the water in your tank. Bacteria use oxygen to break down the organic debris they live off. Bacteria in your aquarium are not necessarily bad. Still, just as with nutrients, too many can be harmful rather than helpful. Finally, protein skimmers grant oxygen easier access to your tank. By keeping the surface of your water clean, oxygen exchange is encouraged. This means it can enter the surface of your water without being inhibited by a film of scum. As we mentioned earlier, a protein skimmer can be a boon, not just for your fish, but for you too. It will reduce the amount of cleaning you have to stay on top of. An aquarium can take a lot of work, so reducing chores wherever possible is always a plus. Think about it. Without a protein skimmer, who will be removing all the surface scum from your aquarium? Who has to make sure that scum doesn’t build up? That’s right, you will. Not only that, but some organic waste is invisible and cannot be removed manually. You’ll find yourself having to wipe down the sides of your tank periodically as well as clearing out scum. A protein skimmer can eliminate this maintenance task for you. It consistently filters the surface water of your aquarium, getting rid of all these compounds before they turn into scum. Think of it as the perfect partner to your aquarium water filter. Corals are beautiful additions to any marine or reef aquarium. They also serve a purpose: in the oceans, these life forms support all kinds of marine life. Your aquarium should replicate a natural ecosystem in miniature. It is important to prioritize the health and growth of your coral, just as you do your fish and plants. A protein skimmer can improve coral growth by several means. Firstly, we’ve established they are great for oxygen diffusion. Higher levels of oxygen mean your corals are more likely to grow faster. But they also work to get rid of excess nutrients in your tank. Corals tend to be more sensitive to some types of bacteria than fish or other plant life. Certain species of bacteria can even be fatal to your coral. With a protein skimmer, you don’t have to worry about the unwanted presence of the wrong sorts of bacteria. 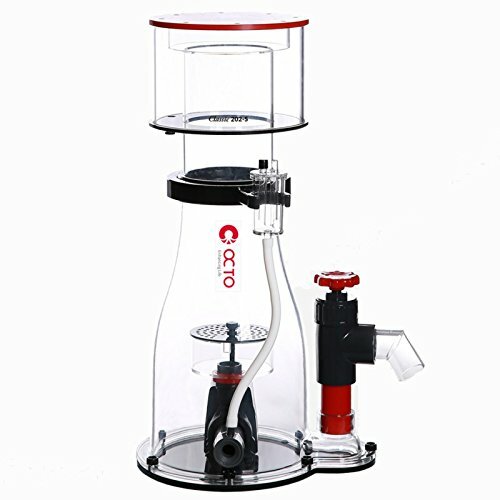 There are several varieties of protein skimmers available to choose from. You should get acquainted with the different variations available on the market before you start shopping. 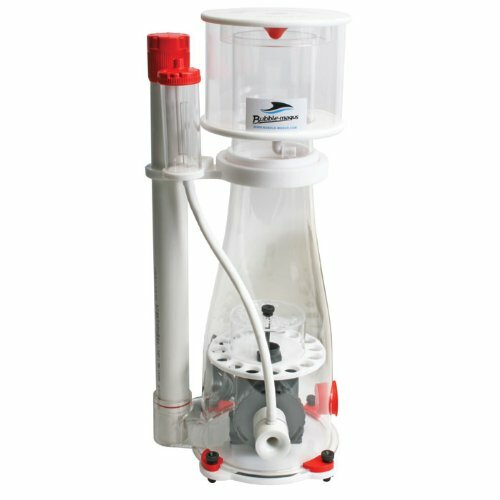 In-sump protein skimmers can be placed into the sump of your saltwater aquarium. If you already have a sump, this type might be best for you. If not, you can always install one before buying a protein skimmer. Models in this category tend to be more versatile than others. You have more choices when it comes to how the foam is produced and redistributed back to the collection cup. In-sump models are also more discreet than other models as the sump conceals them. They’re ideal for those of you who hate to waste space or dislike visible equipment. HOB refers to how a product is mounted. The letters stand for “Hang On Back.” As this implies, these skimmers are mounted on the rim of your tank. This makes for a rapid installation and setup as all you have to do is hang it, and you’re ready to go. HOB protein skimmers are often more compact than other types. Most models are meant to be mounted inside your aquarium. Internal protein skimmers are placed directly into your aquarium. Obviously, this means that these models will take up space inside your tank. On the positive side, there is no risk of a mess as there is with external protein skimmers. No possibility of accidental drips or overflows, the whole thing stays underwater. Internal protein skimmers are also an option for those of you who don’t want or cannot install sumps. External or recirculating protein skimmers are built to work outside of your tank. Water is drawn into the skimmer, cleaned, and recirculated back into your aquarium. On the majority of external skimmers, you’ll have precise control over the volume of water circulating inside the skimmer. Leaking could be a concern, however, since it is housed outside of your aquarium. Now you understand how a protein skimmer functions and what it can bring your aquarium, and the different types available, it’s time to dive into what you should be looking for in a top protein skimmer. In the next section you’ll learn what to keep in mind before you take the plunge and invest in one of your own. There is a reason a great deal of aquarium equipment is rated according to size. The power and capacity of the gadget in question must be appropriate for your aquarium. Protein skimmers are no exception to this rule. You need to check if the protein skimmer you’re considering will fit with your aquarium. If it’s too weak, it won’t function as intended. Too strong, and it could wreak havoc with your ecosystem. Even if your current tank is small, it’s useful to consider the maximum size rating of potential protein skimmers. If you have plans to increase your aquarium size later on, then you might not have to buy a new skimmer. We’ve briefly touched on the mechanisms protein skimmers use to function. How the pump runs will influence how efficient it is. The more micro-bubbles (foam) are produced, the more effective the skimmer will be. Bubbles should be small, preferably less than one millimeter in diameter. They should also have prolonged contact with the water in your tank, to gather as much debris as possible. 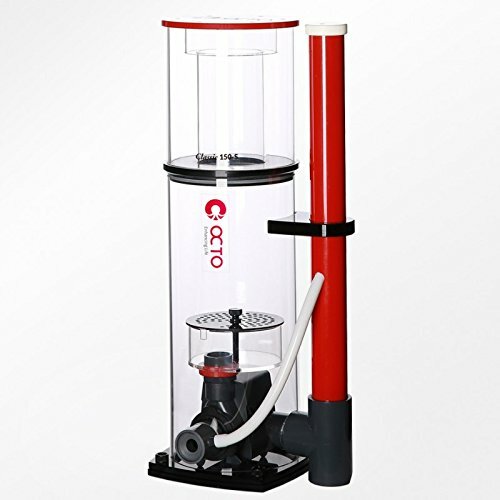 There are three broad categories of protein skimmer pumps: airstone, venturi, and turbo. These pumps are also known as countercurrent pumps. They necessitate a water pump, air pump, or both. The most common setup is that air is bubbled through the air-stone into a column. Water from the tank enters the column from the top. The air and water form a vortex, mixing the two together. In this manner, bubbles are formed, clearing out the water. Venturi pumps rely on air injection and pressure. Essentially, air pushes water through a tube that is narrowed, similar to an hourglass. The water is forced through this tube under high pressure. Once the water passes through the narrow middle, the pressure abruptly drops. Air is sucked in and mixed with the water, producing bubbles. The greater the pressure the water is exposed to, the higher the volume of bubbles (or foam). Turbo skimmers are also known as needle-wheel skimmers. Air and water are drawn into the pump and agitated with impeller blades. The resultant froth is then pushed into the chamber of the skimmer. The reaction chamber is where all the action happens. The larger it is, the greater the volume of water that can be processed at once. You want as much waste to be removed from your aquarium as rapidly as possible. Protein skimmers with bigger reaction chambers tend to be more efficient than those with smaller ones. No one likes complex equipment: or at least, most of us don’t. A protein skimmer is not simplistic by any means, but it should be easy to control. You want to be able to have control over how your protein skimmer processes water. Even if a skimmer is rated for an aquarium of your size, that doesn’t mean it won’t require adjustment. A decent model should allow you to limit the water level. This is crucial for external skimmers in particular. You don’t want to end up mopping up spills if the water overflows. Protein skimmers are not supposed to be repeat purchases. Once you buy one, it should last for a long time. Materials matter when it comes to sensitive equipment like protein skimmers. If you buy one that is poorly built, it is more likely to malfunction or break down. Equipment that doesn’t work as anticipated can be dangerous to the environment and the residents of your tank. Apart from that, badly crafted skimmers are a waste of your money. Prioritize the build and quality above all else. Yes, it will likely cost you more. Still, you’ll get a guarantee of integrity and performance that’s worth more in the long term. A protein skimmer is not a set-and-forget gadget. You’ll have to stay on top of maintenance to keep it in optimal condition. This involves emptying waste from the collection cup, cleaning moving parts, etc. When you’re thinking about which type to buy, factor in upkeep. Certain models are higher maintenance than others. You may be drawn to smaller models, but think about the maintenance. A tiny collection cup means that you’ll have to empty it more often. Emptying your protein skimmer can’t be neglected or put off. If the waste collection cup is full, it could backflow into your aquarium. Skimmers that use an airstone need to have the airstone replaced every so often. Will you be able to find replacement airstones conveniently? Is this something you’re willing to deal with repeatedly? Think about cleaning too. Is taking your chosen model apart and putting it back together going to be simple? Are the separate parts fragile and easy to break if mishandled? Every aquarium owner is different. Maintenance demands that may be fine for one person can be too much to handle for another. Be honest with yourself about your desired approach to maintenance before you pick a protein skimmer. We don’t recommend skimping when it comes to buying your protein skimmer. Aiming for the least costly model usually isn’t the right approach. Still, you should set a realistic budget and stick to it. You don’t have to break the bank! We’ve reviewed the best protein skimmers of 2019 for you to consider. You’re bound to find an option below that will meet your needs and expectations. The Bubble Magus BM-Curve 5 protein skimmer is an in-sump skimmer. The pump is venturi-run, and you can use it with tanks up to 140 gallons. This skimmer is great for those of you who have small tanks but hope to expand in the future. This skimmer produces abundant amounts of foam. As its body is curved, circulation back to the collection cup is smooth. Despite being powerful, the skimmer has a handy silencing mechanism. It is equipped with an air silencer so you won’t have to hear it in action. Control and maintenance is straightforward. To adjust the water level to suit your tank, all you have to do is turn a knob and set it. The quick-release collection cup is easy to remove and clean. Best of all, this skimmer includes a drain for the collection cup so that you don’t have to empty it constantly. Dimensions: 29 x 6 x 10 inches. Compatible with tanks up to 140 gallons. Clears out waste thoroughly—nothing is left behind. Suitable for a range of tank sizes. Finding the right water level for your tank can take time. Doesn’t come with instructions (download from web). This in-sump protein skimmer is ideal for aquarium tanks ranging from 75 to 240 gallons. The AC20287 is conservative when it comes to energy (just nine watts) and operates noiselessly. One of the main benefits of this model is how low effort it is. Installation is a breeze, you can get it up and running quickly. The water level is controlled through the gate valve, which is simple to handle. The skimmer is built for convenience. It comes with a narrow, 4-inch neck to gently transition skimmed foam to the collection cup. You won’t have to worry about overflows or blockages. As it has a collection drainage cup, you can reduce your maintenance time. All you’ll have to do is clean the easy-release collection cup itself. This protein skimmer works rapidly and efficiently. Depending on the state of your tank, you can expect it to labor hard for the first few days after installation. For sumps 7.9 to 8.7 inches deep. Compatible with tanks up to 240 gallons. If you have a large-sized tank and cherish space, this in-sump protein skimmer might be the one for you. It is capable of working in tanks from 180 to 260 gallons in size. At the same time, the Classic 202-S is built to conserve space. 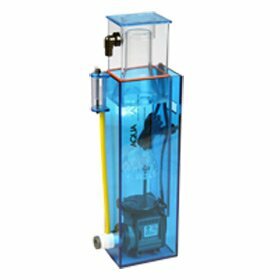 With a compact body, this skimmer can fit in sumps that have limited room for cumbersome equipment. Despite the small size, this skimmer doesn’t compromise on cleaning action. It generates thick rich foam that will collect anything and everything nasty in your saltwater tank. Don’t expect to be continually emptying the collection cup. You can take advantage of the drain to take over that chore for you. As this skimmer is made from acrylic, assembling it and taking it apart is hassle-free. It’s sturdy, meaning it will last you for a long time. You don’t have to be concerned about accidentally mishandling or breaking it. Body dimensions: 8.27 to 5.12 inches. Footprint: 12.4 x 10 inches. Water draw: approximately 211 gallons per hour (GPH). Compatible with tanks 180 to 265 gallons. Thick foam for thorough skimming. Compact for smaller sumps, even with larger tanks. Can work with smaller tanks than specified (g. 100 gallons). Some users have said it’s somewhat noisy. 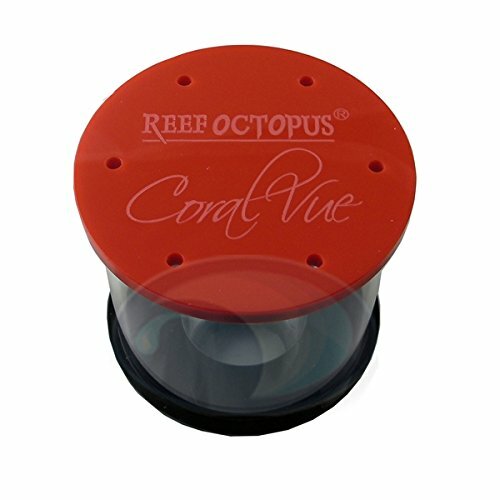 Reef Octopus doesn’t just make protein skimmers for big aquariums. The 150 Space Saver suits tanks of 100 gallons or less. This sleekly designed product was crafted to be inconspicuous. It won’t overwhelm the space in smaller aquariums. At the same time, this skimmer is just as powerful as some larger models. You can expect that it will get your water clear of waste and keep it that way. An added bonus is that this efficiency happens quietly. There are no vibrations or irritating noises while this skimmer is running. All you’ll have to do in the way of maintenance is empty out the collection cup, and periodic cleaning. It’s not a challenge to take apart this skimmer and put it back together after cleaning. There’s no break-in period to endure —this skimmer gets to work right away. You’ll see results in your aquarium within hours of setting it up. Dimensions: 10 x 13 x 20 inches. Footprint: 7.3 x 9.45 inches. Max flow: 140 gallons per hour (GPH). Assembly, installation, and maintenance are easy. Strong cleaning action but performs quietly. Depending on your sump, this may require a stand. This robust acrylic in-sump protein skimmer suits tanks up to 130 gallons. It is fairly compact, more like what you would expect for a smaller tank skimmer. The 110-INT Needle Wheel has plenty of other advantages. This skimmer is energy-efficient, running on only nine watts per hour. And since it includes an air silencer, you can run it at all hours without being disturbed. The pinwheel impellers are the stand-out feature of this model. Combined with a venturi-run pump, this skimmer does it’s job consistently—and does it well. As long as you keep it on, your tank will stay free of unnecessary waste indefinitely. Controlling the flow rate, water level, and other aspects is extremely easy. A narrowed neck allows dirt-packed foam to transition to the collection cup without excess force. This way, the pressure of the skimmer won’t overwhelm the build, minimizing the chances of cracks. Dimensions: 5-inch body, 19.75 inches height. Footprint: 10.4 x 7 inches. Recommended for sumps 7 to 8 inches deep. Water draw: 92 gallons per hour (GPH). Compatible with tanks up to 130 gallons. Appropriate for mid-sized to large tanks. May need a stand in deeper sumps. Can take time to break in. Small neck can require frequent cleaning. The Aquamaxx Ws-1 in-sump protein skimmer is ideal for nano aquariums and smaller tanks. This skimmer was constructed with space saving in mind. The venturi-run pump is inside the body itself to make it even more petite. The pumping mechanism of this skimmer is a major benefit. The Italian-crafted pump, combined with a venturi-based impeller, creates rich, waste-attracting foam. You’ll find that the collection cup fills up rapidly when you initially set it to work. The skimmer comes with a drain fitting for precisely this reason. If you’re not interested in dumping the collection cup, you can prepare a separate reservoir to collect your tank waste. Everything about this skimmer allows for stress-free use. Made of acrylic, the parts can be detached and put back together without too much effort. It will run silently so as not to bother you or the residents of your tank. Height: 14 inches (excluding collection cup). Footprint: 5.9 x 3.2 inches. Compatible with tanks between 30 and 65 gallons. No-break in period, starts skimming straight away. Can overflow during initial setup. A protein skimmer can be an invaluable addition to your marine or reef aquarium. The plants and animals will benefit from improved water quality, plus you’ll find yourself with one less pesky maintenance-related duty to stay on top of. If you have any questions or comments about protein skimmers, drop us a line in the comments below. We always love to hear from our readers, and we’ll be sure to get back to you.